At the Annual Town Meeting earlier this month there was significant debate about the Select Board approved cuts of $726K from the School Dept FY2014 proposed budget. School Superintendent Marie Doyle armed with charts and other information described how the budget as approved by the Select Board was going to have a significant effect on the quality of education in Longmeadow. Article #6- the FY14 budget was then amended by the Town Meeting members to provide for an additional $353K of funding. I spoke during the debate on this amendment so I thought that it would be worthwhile to share my comments with other town residents who may not have attended this meeting. Below is a video excerpt of my remarks (courtesy of LCTV) with the cited tables inserted. As mentioned in the above video, there are significant school related line items in the overall budget that are not usually considered when the School Dept budget is being reviewed. These items include School Dept Employee + Retiree Benefits (including Health Care, Insurance, etc.) and Debt Service (Interest + Principal repayment on school project bonds). As you can see from Table I below the cost of these items is not trivial. During the past two years, the total cost of delivering a quality education in Longmeadow has increased by $4.8 million or 13.2%- a large portion of this increase is the debt service for our new high school. Given that the School Maintenance is not listed here but is included within the Town Govt budget, the true cost of delivering a quality education in Longmeadow is even higher than that shown in Table I. Over the next ten years, this recent increase in total education costs will translate to almost $50 million in taxpayer money. With all of the pressing infrastructure needs of our town ranging from streets/sidewalks to a new DPW facility and middle school renovation/new building, our school department needs to find a way to reduce the cost of delivering their services. Yes, Mr. Grant there is a capital plan! At the recent Town Meeting Alex Grant criticized the Select Board for not having a "capital plan" for improvement of the town's infrastructure. Furthermore, he stated that without a capital plan the town was wasting money including projects like the Maple Road water and sewer repairs. Paul Santaniello, current chairman of the Longmeadow Select Board responded to this criticism by Alex Grant at the Select Board meeting earlier this week. He stated that the Town of Longmeadow does have a capital plan for infrastructure improvements including both town and school department needs. It is a "rolling" 5 year plan which is updated annually. The Maple Road project was on the list but because of funding considerations, the long overdue improvements were not initiated until last fall. Stephen Crane, the new Town Manager for Longmeadow took the opportunity during the Town Meeting to state that the interim town manager (Mr. Barry Del Castilho) was incorrect when he stated that there was no capital fund. It is true that the town lacks a capital funding plan. Mr. Grant.... it is time to move on to other issues. current member of the Longmeadow Select Board to the Longmeadow Buzz blog and Longmeadow News for publication this week. 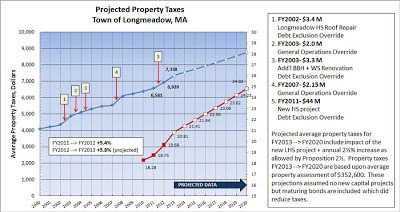 The development of the 2014 town budget demonstrated the limitations imposed on a fully “built-out” town like Longmeadow. With property tax increases limited to 2-1/2% year over year, most cities and towns in the Commonwealth turn to new growth, the development of previously vacant properties, to provide the funds needed to sustain their government’s budget. In the 1980’s Longmeadow garnered additional tax revenue from the development of Williamsburg Drive, in the 1990’s it was from Jonquil Lane and in the 2000’s Pendleton Lane. 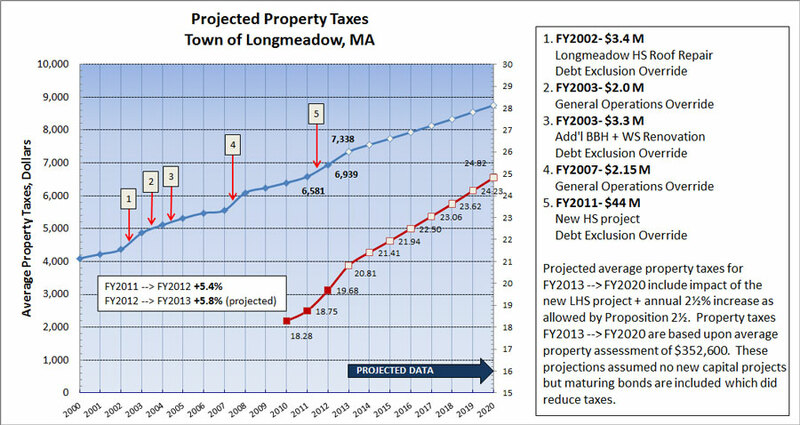 With no new housing tracts available for development, for the past seven years Longmeadow has found itself in the dilemma of revenue increases being limited by proposition 2-1/2. But this perceived reliance on real estate tax revenues need not restrict our ability to fund capital needs, wage and salary increase, and new service initiatives within Longmeadow. Since being elected to the Select Board in 2009, I have focused on both reducing costs and identifying new sources of income (to offset the loss of new growth income). On the income side, I initiated the town’s adoption the optional state meals tax that will provide as much as $80,000 a year in new revenue to the town. On the expense side, I negotiated a lower rate on the trash pick-up program, worked with the town CFO to secure low cost electrical rates for town buildings, saved over $100,000 on the purchase of replacement water meters, and secured a grant from WMECo that installed energy efficient lighting throughout town buildings, a project that will save the town tens of thousands of dollars each year. Our budget dollars are going further than ever – one of the main reasons why the Town is now seven years into the 2007 Proposition 2-1/2 over-ride that was designed to provide revenue for a balanced budget for three years. There are ideas for increased revenue and cost savings items that have yet to be pursued. The Select Board is examining opportunities for purchasing the street lights which are all currently leased, and following that purchase with the installation of high efficiency lighting to lower operating costs. Opportunities exist for providing town residents with added services, such as wireless internet, which can provide income to the town while saving residents in their monthly payments for high speed internet and smart phone data plans. Although our first attempt at placing a solar energy facility on our town landfill was deferred due to its marginal economics, changing solar economics may yet provide benefit the town from the installation of a passive renewable energy system on the roof of a town building or elsewhere. It’s not farfetched to imagine that one day a community based solar facility will provide low cost electricity to power the homes and vehicles of town residents. Our ability to provide the services all our citizens want at a tax rate that all our citizens can afford is an achievable goal. With vision and follow-through we can affordably provide the funds the town needs and the services town residents want. For the past four years, working with the Select Board for the citizens of Longmeadow, I have shown that vision and follow-through. Much progress has been achieved but there is much more that is possible. I ask for your vote on June 11th so that I can continue to work for the residents of this town to address the issues that will retain the character and community that drew each of us to Longmeadow. Longmeadow Community TV provided a LIVE opportunity during last weekend's Long Meddowe Days for the 3 candidates for Select Board (Mark Gold, Mark Barowsky and Alex Grant) to address the voters of Longmeadow. Below are the taped interviews for each of the three candidates courtesy of LCTV.